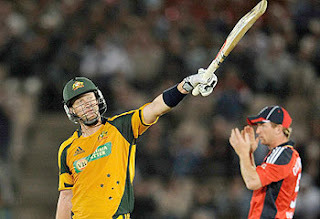 wdnicolson.com - An NRL Blog: NRL Tips Qualifying Finals 2009 - AFL Tips Semi Finals Week Two 2009 - The Wallabies WIN! - Australia 3-0 up in One Dayers! - NFL starts this weekend! NRL Tips Qualifying Finals 2009 - AFL Tips Semi Finals Week Two 2009 - The Wallabies WIN! - Australia 3-0 up in One Dayers! - NFL starts this weekend! NRL Tips Qualifying Finals 2009 - AFL Tips Semi Finals Week Two 2009 - The Wallabies WIN! - Australia 3-0 up in One Dayers! - NFL starts this weekend! =============================================================== First up, apologies for the Ray Warren photo last week... It was a lapse in judgement on my part and hopefully it will never happen again. 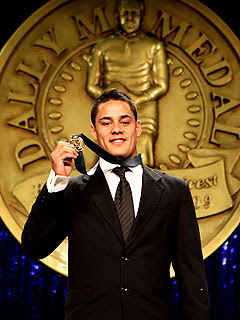 Here's a picture of Jarryd Hayne accepting his Dally M Award instead. If only the Daily Telegraph didn't muddy the waters of the official Player of the Year Award... still he's a worthy winner, it's just a pity about the way it's decided. The week that was and will be... The AFL Finals are a week old with the Bombers and Blues GORN!, while the NRL Finals kick-off this weekend with 8 teams still alive in the Premiership. And lost in all of that is the Wallabies comprehensive win over the Springboks in Brisbane on Saturday Night. Australia are 3-0 up in the Best of Seven One Day Series against England and a new National Football League season starts today! This is the best time of year to follow sport. >>> In the NRL... The Finals are here! Get yourself subscribed to the most comprehensive NRL Tweet around at http://www.twitter.com/NRL_Finals_2009 and don't miss a thing that actually matters for the Qualifying Finals and beyond. There are already Video Previews up for each game and there'll be live updates during all games throughout the Finals - more than just the scores, we'll call it as we see it. Four Qualifying Finals on the schedule: Storm v Sea Eagles (FRI), Titans v Broncos & Bulldogs v Knights (SAT) and Dragons v Eels (SUN). Eight teams remain in the hunt for the 2009 NRL Premiership! > For some great analysis on the Finalists by Phil Gould, Benji Marshall and Johnathan Thurston download the audio from their segment on The Footy Show here. >>> In the AFL... The second week of the Finals is here with the Lions taking on the Bulldogs and the Crows battling the depleted Magpies. Premiership heavyweights St.Kilda and Geelong earned a week off and a passage straight into the Preliminary Finals with wins over Collingwood and the Western Bulldogs respectively - and deserve favouritism to meet in the Grand Final in 3 weeks time. For Essendon and Carlton the season is over, and the suspension of Chris Judd for questionable contact with the head of an opponent rubbed salt into a very deep wound inflicted by Brisbane's comeback last Saturday Night. >>> In Cricket... Australia have quietly - and I mean quietly because very few people care now the Ashes are lost - gone about building a 3-0 lead in the One Day Series against England. Somehow the Cameron White experiment at Number Three paid off in Game 3 with the Victorian batsman (because he is NOT an allrounder). >>> In Rugby Union... Australia are no longer winless in the Tri-Nations! But I'll say it one more time: it really doesn't matter in the grand scheme of things. Let's wait til 2010 before we judge how the Wallabies are really going, because that Tri-Nations Series will give us a very strong indication of what shape we are in heading into the 2011 World Cup in New Zealand. South Africa are in New Zealand for another Test Match this Saturday. You can follow these sports and more, here on wdnicolson.blogspot.com or via my Twitter feed. Can you kick a goal from the sideline just 1.5 metres from the tryline - interested in giving it a go? Go to http://wdnicolson.blogspot.com/2009/05/kick-off-2009-are-you-up-to-challenge.html for more information on Kick-Off 2009! NRL & AFL Match Previews below. =================================================================== NRL FINALS SERIES 2009 Qualifying Finals Previews Quick hit Previews for the Greatest Game of All. Click the links for Video Previews and more content on each game. =============================================== The best way to follow the 2009 Finals Series is to follow NRL_Finals_2009 on Twitter. On the first day of operation alone, we produced 30 Tweets - with some great nuggets of information in there, as well as news as it breaks. For the Finals Games themselves, regular Tweets will be uploaded giving you an instant evaluation of how the game is being played out and what to watch out for during the match. If you don't want to miss a thing - subscribe right now or follow it on the main page of wdnicolson.blogspot.com on the right side column. =============================================== SEA EAGLES over STORM > Very hard game to pick given it is in Melbourne. But it also isn't at Olympic Park which is a big plus for the Sea Eagles - especially given the game is at night. Two key players could play who weren't named (Jamie Lyon for Manly & Jeff Lima for Melbourne). I'm tipping Manly on the road based on their dominant win over the Titans last week. Manly by 6. Full Preview HERE. BRONCOS over TITANS > The Titans get no love despite finishing in 3rd spot and making a late charge at the Minor Premiership. They have nufties in the centres this week against Israel Folau and Justin Hodges and the Broncos forward pack has stood up of late. Not supremely confident in Brisbane but I'll tip them by enough. Full Preview HERE. BULLDOGS over KNIGHTS > No Brett Kimmorley opens the door to the Knights in a game that is no gimme tipping wise. The Dogs should win the forward battle but it'll be up to the combination of Daniel Holdsworth and Ben Roberts to win them the game. Knights could be without Isaac De Gois and Zeb Taia which would make a win extremely tough to achieve if they don't play. But with no Kimmorley... Dogs by 10 points. Full Preview HERE. DRAGONS over EELS > Parramatta needed to keep their momentum going all the way into the Finals... they didn't and now face the team that crushed them 37-0 last Friday Night. Jarryd Hayne will have Nathan Hindmarsh and Eric Grothe Jr back to support him - but last week's loss was horrendous and hard to rebound from against the same opposition. Dragons by 12-16 points. Full Preview HERE. The first and second parts of our 2009 NRL Premiership Reflections Series are also available on this site and are well worth a read. 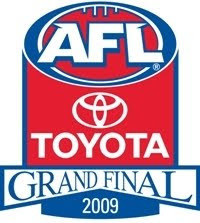 =================================================================== AFL FINALS SERIES 2009 WEEK TWO PREVIEWS Two teams are out of the running: & . Two have a week off: & . Leaving four to fight for survival in the Semi-Finals stage of the 2009 AFL Finals Series: Friday Night @ MCG, Melbourne #3 BULLDOGS v #6 LIONS Skinny: Despite being held at bay by Geelong, the Bulldogs have warmed up nicely for this semi final. While they would've preferred a week off and a birth in the Preliminary Final obviously, they got a great hitout against a top opponent and now face the Brisbane Lions who shocked Carlton in the last term on Saturday Night to steal a win. The Dogs don't deserve to go out in straight sets after looking like the 3rd best team all year (Collingwood fans might disagree) and I think they'll get an early advantage they won't relinquish on Friday Night at the 'G. Bulldogs by 22 points. Saturday Night @ MCG, Melbourne #5 CROWS v #4 MAGPIES Skinny: Adelaide crushed the Bombers by a margin even greater than predicted - a sign they are serious about a run at the premiership in 2009. They could've put the cue in the rack entering the final term against Essendon but instead were ruthless and they'll need to adopt that attitude with Collingwood. The Magpies have been dealt some savage injury blows late in the season and if they go out in consecutive finals it will still be an opportunity missed. But I can't see them recovering and beating a Crows side that will be a handful next week. CROWS by 17 points. =================================================================== 2009 ASHES UPDATE Below are Cameron White's scores batting at Number 3 in the current One Day Series against England. 1st ODI: 53 2nd ODI: 42 3rd ODI 105 Don't worry I'm as shocked as you are... He still can't bowl though! Follow me on Twitter during the Day's Play. ============================================================ WALLABIES TEST SERIES WINTER 2009 Australia's 21-6 win over the Springboks ended a four match losing streak in the Tri-Nations. South Africa could afford the loss in the race for the Tri-Nations but need to beat or draw with the Kiwis this weekend to secure the trophy. 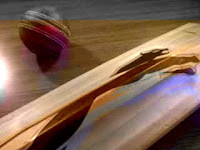 Here is the Test Schedule for Winter 2009: June 6 Sydney 7:30pm (EST) Bundaberg Rum Series v Barbarians Won 55-7 June 13 Canberra 7.30pm (EST) Bundaberg Rum Series v Italy Won 31-8 June 20 Melbourne 8.00pm (EST) Bundaberg Rum Series v Italy Won 34-12 June 27 Sydney 8.00pm (EST) Bundaberg Rum Series v France Won 22-6 July 18 Auckland 5.35pm (EST) Tri-Nations v New Zealand Lost 22-16 August 8 Cape Town 11.00pm (EST) Tri-Nations v South Africa Loss 29-17 August 22 Sydney 8.05pm (EST) Tri-Nations v New Zealand Lost 19-18 August 29 Perth 8.05pm (EST) Tri-Nations v South Africa Lost 32-25 September 5 Brisbane 8.05pm (EST) Tri-Nations v South Africa Won 21-6 September 19 Wellington 5.35pm (EST) Tri-Nations v New Zealand =================================================================== The National Football League starts this weekend (well Thursday in the USA) with the defending title holders the Pittsburgh Steelers taking on the Tennessee Titans. A full Season Preview was added to this site recently so go check it out. And if you want to see the coolest Schedule Page in the history of sports - do yourself a favour CLICK HERE For the record my picks for Week One are: Steelers, Bengals, Cowboys, Falcons, Colts, Giants, Eagles, Ravens, Texans, Packers, Seahawks, 49ers, Saints, Patriots, Vikings and Chargers. My Super Bowl pick is located in the Season Preview. Good luck with your tips this weekend!